Microsoft is playing catch-up with Google with their “Windows Live” brand. They released an online mapping website, Windows Live Local. Their interface isn’t as good as Google Maps, e.g. you can’t pan between tiles in “Bird’s Eye” view. 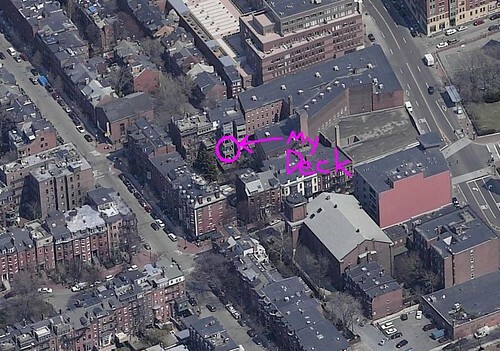 They do, however, have higher resolution data for Boston. For example, you can clearly see the deck of my apartment (pictured), my office window, and my parent’s house.